Window treatments are a small touch that truly makes a house a home, so figuring out how to save money on curtains is something many people try to do. Curtains do not have to be expensive, multi-layered looks to dress up a room. Even if you don't have a lot of money to spend, putting thrifty decorating ideas into practice is a wonderful way to save money on home décor. Curtains purchased at an interior design store or custom-ordered are expensive, so consider an alternative to traditional curtains if money is tight or you have unusual sized windows. Instead of having full curtain panels, hang up a simple valance and mini blinds. Mini blinds are cheap and are available everywhere, and a valance dresses up a window without costing too much. A valance comes in different widths and fabric styles, so choose one that fits with the overall look of your home's décor. 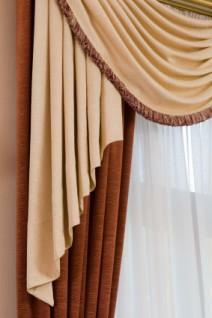 Drape a long piece of hemmed fabric in a swag fashion across the top of a window instead of curtains or a valance. Consider using a rectangular fabric tablecloth or a bed sheet, since no one will be able to tell the original purpose of the fabric once it's hung. Search for cheap fabric at a local craft or fabric store if you want something with a particular pattern. Check outlets and online retailers for discontinued and irregular curtains at a steep discount. Look for curtains at yard sales or consignment shops. Purchasing a home dye kit is cheap and your curtains will match your décor, regardless of their original color. Comparison shop when it comes to ready-made curtains, because a discount at one store might be the regular everyday price at another. Don't be afraid to purchase an off-brand of curtains, rather than name brand, if the curtains are well made or going into an infrequently used room. If you can sew a straight line, you can likely make simple curtain panels yourself. Purchase cheap fabric in a length and width that fits your area. Hem the edges. Fold the top down so that you can easily slip a curtain wire or rod through the top and then sew the top down. Plenty of free sewing patterns for curtains are available online for people who want to make a curtain with pleats or a liner. Keep in mind that it isn't just the curtains themselves that cost a lot of money, but so can the hardware and accessories. Instead of purchasing a traditional curtain rod, pick up a cheap wooden dowel and paint it a neutral color. Curtain wires are easy to hang and cheap, too. Skip purchasing the matching tiebacks for curtains. For lightweight curtains, use a wide satin ribbon in a coordinating color. Thick braided cord works well for heavier curtain fabrics. While you work on how to save money on curtains, remember that sometimes, cheapest isn't always the best. Poorly-made curtains in a frequently used area will only need replacing more quickly. Moreover, spending a little more on curtains might help cut costs in other areas. Save money on home energy costs with your curtains, too. Purchasing specialty curtains, such as blackout drapes or thermal drapes, ultimately saves money. These curtains can help keep rooms cooler in the summer and warmer in the winter, due to the fabrics and how they are made. Figuring out how to save money on curtains is easy if you think creatively. Saving money around the house is important for keeping your budget in line, and cheap decorating techniques will go a long way in turning a potentially costly project into a cheap one.